Factories were social spaces where the workers shared their lives. 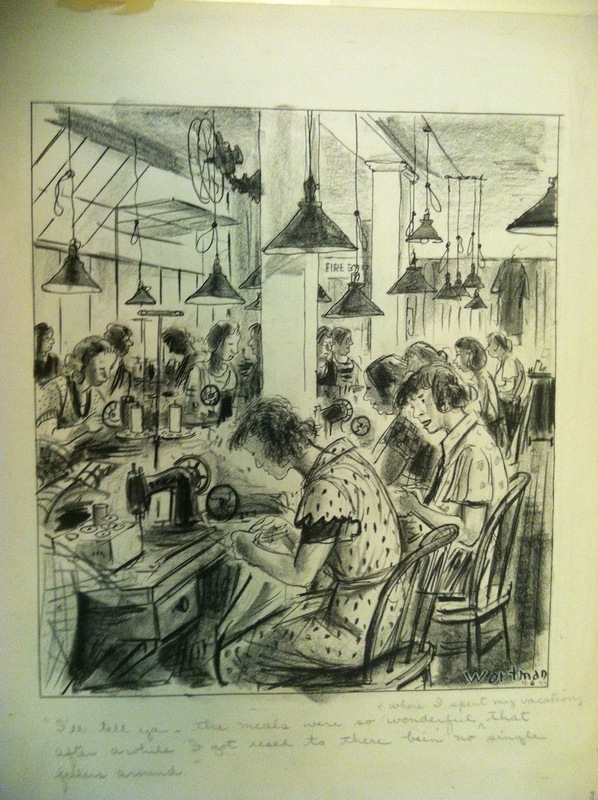 This aspect of the industry is vividly captured in these Denys Wortman cartoons. 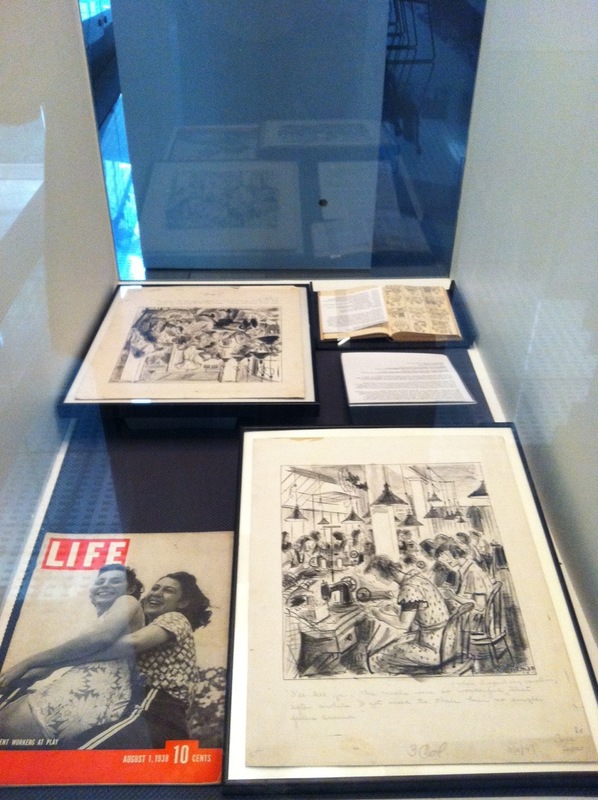 Between 1924 and 1954, Wortman drew six cartoons a week for the New York World and its successors, many of which chronicled everyday life in New York. 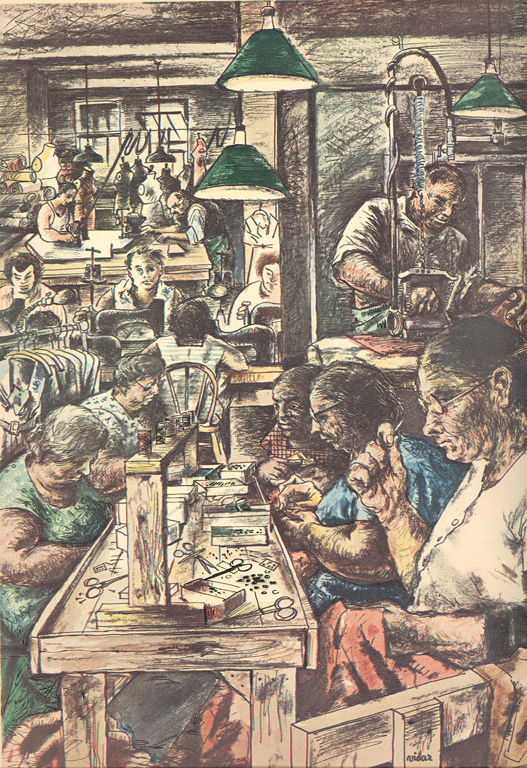 He not only captured the character of garment workers, but also accurately recorded the factory environments. Denys Wortman, "I'll tell you, the meals were so wonderful where I spent my vacation that after a while I got used to there being no single fellers around." 1949, Courtesy of Center for Cartoon Studies. 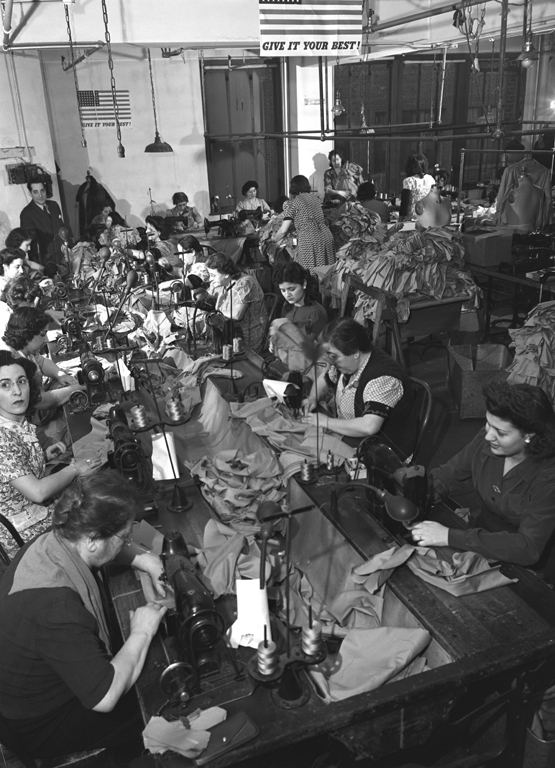 The factory workers were members of the International Ladies Garment Workers' Union (the ILGWU), which bargained with management over wages, hours, and working conditions, but also offerred union members health insurance, educational classes, and vacation opportunities. Murray Sices was a garment manufacturer with a business located just off of Seventh Avenue. He wrote this book in celebration of the garment industry, which, as he noted "is not merely a geographic location," but "a legend. It's the birthplace of miracles." The sketches in the book, probably drawn by Sices himself, are witty snapshots of the district. 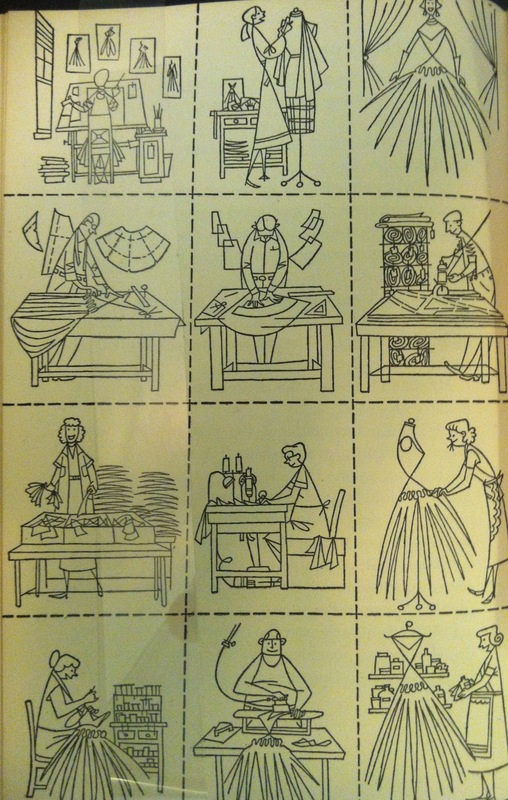 Here he illustrates the jobs involved with the manufacture of each garment. Murray Sices, Seventh Avenue, 1953. Cleaner - removing loose threads and spots. 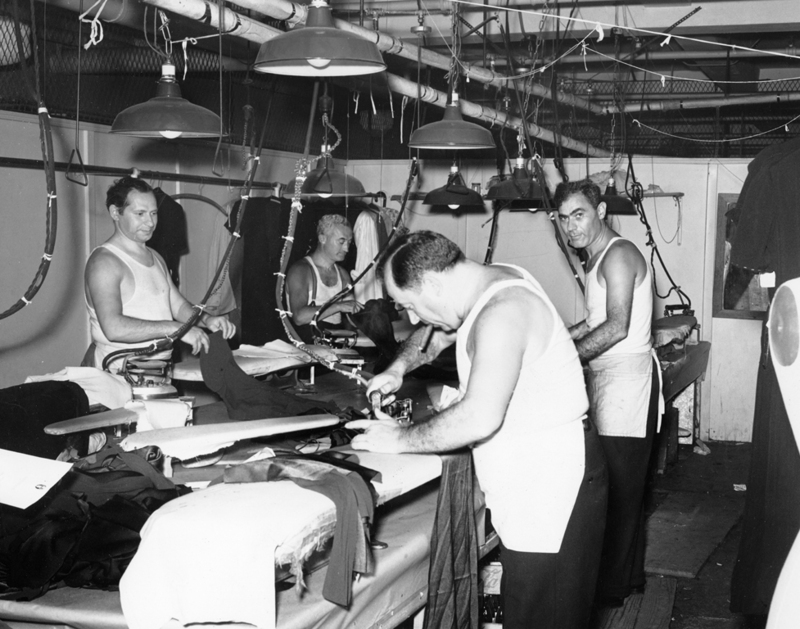 The firms that manufactured garments were mostly small-scale operations, employing fewer than 20 workers. Manufacturing was done in large open spaces. The sewers, or operators, sat at long tables, often placed close to windows, lined with facing rows of sewing machines and wooden chairs. Overhead lighting and individual lamps made detailed sewing easier on tired eyes. Long tables were often set in the center of the factory where the fabric was arranged in lays and then cut with electric shears. 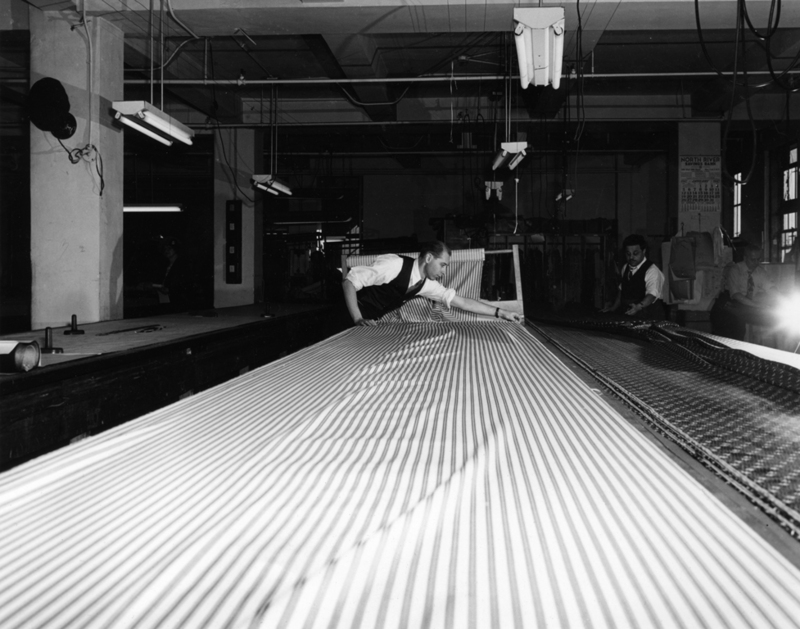 Pressing of the finished garments also took place in a discrete area of the open floor. It took many men and women to manufacture a single garment, each completing a single part of the industrial process. 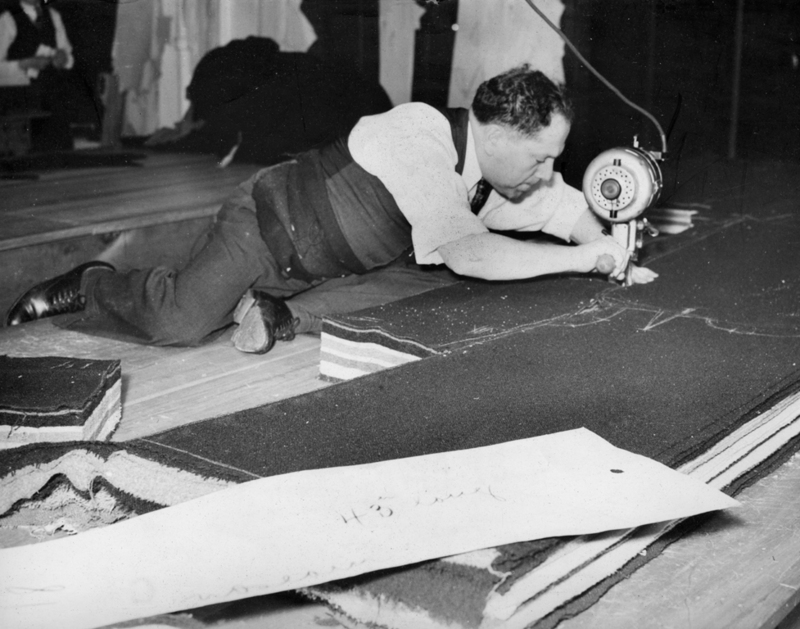 After a garment was designed in a jobber's office, patterns were cut and then chalked onto the top of a pile of a multi-layered fabric set out on a long table by a stretcher. Skilled cutters cut the layers into pieces that were sent to operators working at sewing machines. Finishers hand sewed buttons, buckles, hooks and other accessories onto the garment before sending the finished item to a presser who readied it for shipment. Stretcher, Courtesy of Kheel Center, Cornell University. Cutters, Courtesy of Kheel Center, Cornell University. 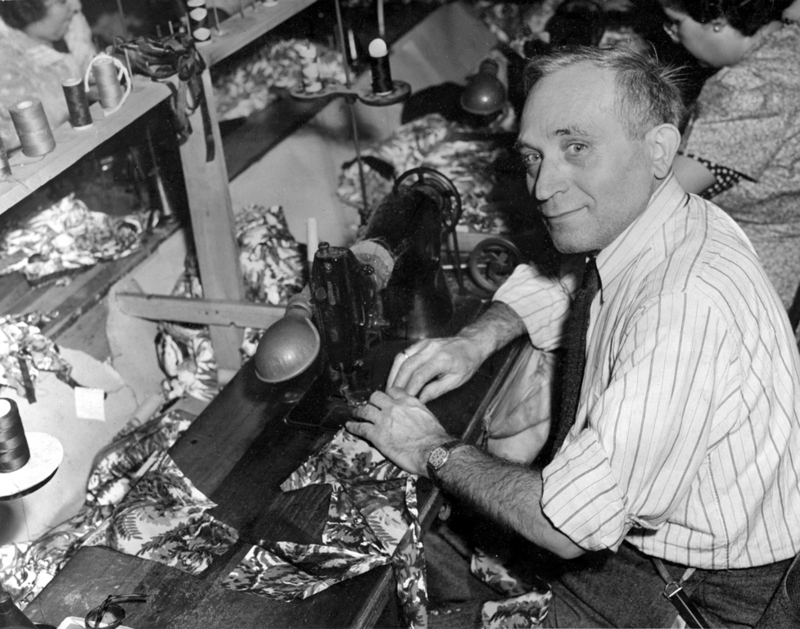 Sewing-machine operator, Courtesy of Kheel Center, Cornell University. Pressers, Courtesy of Kheel Center, Cornell University. 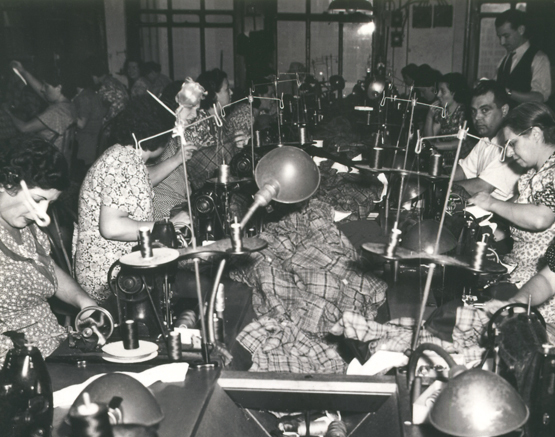 Operators at Their Sewing Machines, c. 1938. Courtesy of New York City Department of Records, Municipal Archives. Frede Vidar, Dresses for $10.75. Fortune, November 1946. Collection of Andrew S. Dolkart. Workers in the N.M. 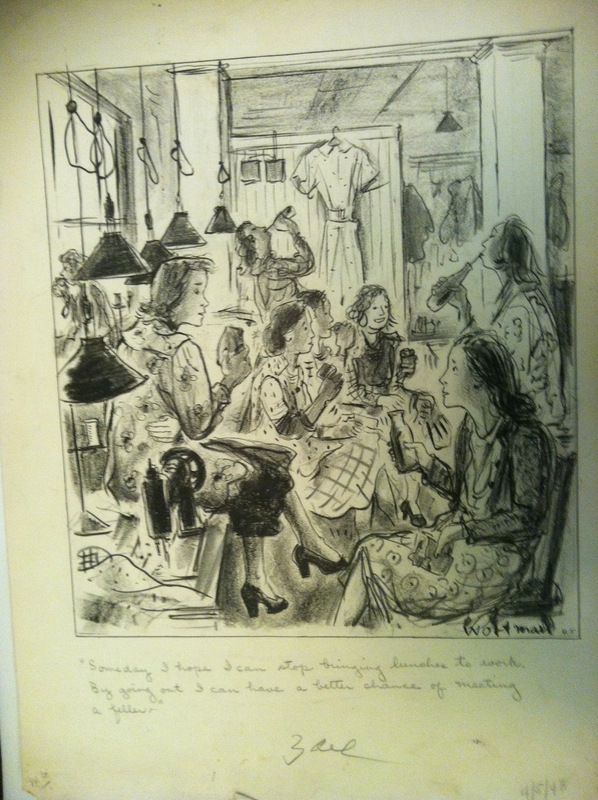 Dress Shop, 1943. Library of Congress.